“The Newberry Library is a really fantastic place, much to my delight. The workshop itself, “New Spain at the Newberry”, was a well-organized event that was both interesting and informative. It began with a short meet-and-greet of all the participants. 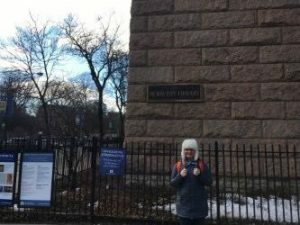 To my surprise, most of the graduate students were not Spanish majors, nor were they ABDs, and I found that to be an intriguing aspect that I had not anticipated. One of the participants was studying art and costumes, another was studying animal husbandry, and yet another was a philosophy student. The organizers had specifically chosen graduate students who did not have an expertise in the field, in order that we could all learn from the experience in an environment of non-specialists who each brought different perspectives to the table. I found this approach created an open and non-intimidating environment that allowed us to ask questions freely. There were two sessions of lecture and discussion in the morning. The first presentation was a lecture on the history of the Ayer Collection and how it came to the Newberry, given by Seonaid Valiant (ASU). These texts were donated by the estate of Edward E. Ayer, an enthusiast of Mexican and Native American history, philanthropist, and collector of books, texts, and historical artifacts. What is important about this is that we, as scholars, are trained to question source material. Ayers was not very selective about his sources (he bought just about anything that he could get his hands on), and there are some documents who material and origins are somewhat mysterious. However, what Ayer did collect and donated is, in no doubt, a trove of intellectual treasures worthy of the library’s careful preservation. The second session, given by Claudia Brittenham (U of Chicago), covered codices drawn after the colonial period in Latin America began. The images we studied were drawn by hand from indigenous scribes into codices that described different social aspects, such as marriage, birth, and death, interesting histories, and land disputes. We discovered and discussed the various types of paper and ink, and I was surprised to learn how well-preserved most of these codices have been, mostly due to the quality of their paper. As a student of medieval symbolism in Spanish literature, I was able to immediately see a resemblance between some of the structures and images of these texts with medieval European documents that I have viewed in Oxford and Paris. It was exciting because I realized that if I am lucky enough to publish my dissertation, this information could help me to write a fifth chapter demonstrating a new (new to me, so to speak) intellectual aspect of the Colombian exchange. The hands-on session occurred in the library. The librarians had laid out a diverse collection of manuscripts and texts that held historical and literary value. As I study early New World texts in my dissertation, this was the most exciting aspect of the workshop. 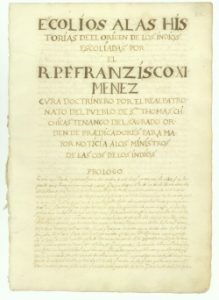 In the Newberry Library are two of the most important manuscripts in all of colonial Latin American history. 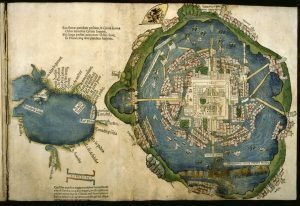 The first is the Cortes map (Ayer 655.51.C8), a map of Tenochtitlán (modern Mexico City) that was probably based on a version drawn up by Hernán Cortés. For a medievalist who studies New World documents and their relationship to medieval symbology, this was a jackpot. The watercolors (painted in much later) are bright and robust, and the images are clear and easy to understand. The second manuscript is a copy of the Popul Vuh (Ayer MS 1515). This is one of the few manuscript copies that exist of the original (now lost) text and it is a priceless gem of cultural and historic heritage. We closed with a really interesting summary of other texts and databases for colonial resources. I found this to be very informative and I look forward to accessing these databases when I work on that fifth chapter of my dissertation!